My understanding is that the fake button is to ensure true waterproof capability. Android Central is pretty downbeat, majority reviews have been down on the fake button. Oh wow the comments are priceless!! It's still IP68 rating same as some other phones with IP68 rating and actual buttons. Think they don't have any other strong reason to justify. I'm all for new stuff but something which you use a lot everyday like power button, volume buttons has to be perfect. It's not like they saved some space or anything since It's still protudes out like actual physical buttons. Obviously I haven't tried but impressions from people who tried hasn't been positive. Who knows may be the delay in release from 7th to 21st is they are tuning this is to be little better? At least I hope so since these buttons are something which will be used a lot everyday. 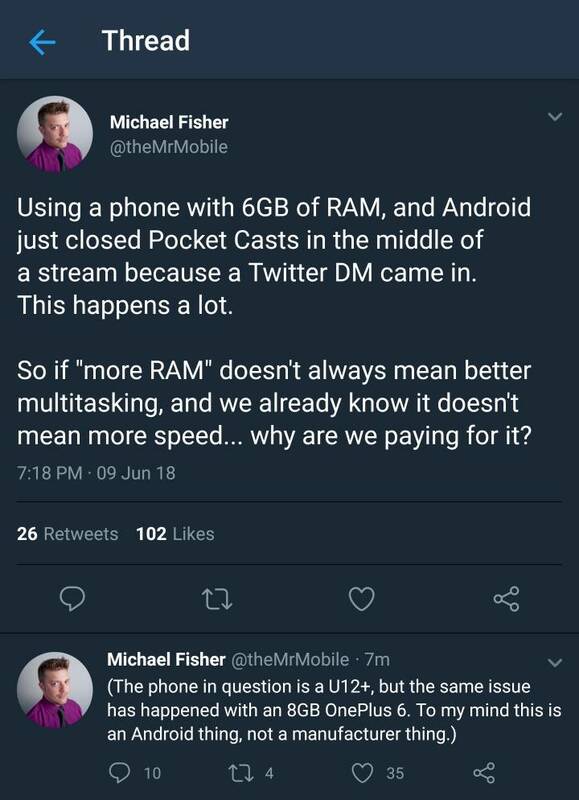 This is some worrying commentary from Mr.Mobile on the U12+, seems memory management is being very aggressive. Well he says it's not specific to U12+ and happened with OP6 as well. So more of an Android thing. Not only that but he must be doing something wrong. High tech travelers review said that he could open a game, come back hours later and it would be exactly where he was when he left it. Doesn't MrMobile even say, "you're mileage may vary"? It may also be a matter of ensuring that the app isn't "optimized" under doze. You must understand Android in order to make it work for you. I spend, at least, two hours on setup. Not even installing apps. I snagged a U12+ at the NYC launch event. And I've already sent it back. I could have written this review - as my complaints are the same. The issues with the pressure sensitive buttons and sides are a deal breaker from the jump. But even if those are fixed, the staleness of the software ruins the rest of the experience. As Alex mentions, its very close to stock - yet so far away. The dialer, contacts, etc are years old and just detract from the flagship experience this otherwise delivers. I just dont understand why at that point HTC doesnt just include the google dialer? I love the haptic button idea in theory. But for something as essential as power and volume buttons - it needs to work every single time. And it just doesnt. Not even 75% of the time. The iPhones home button works exactly like a physical button. Sure the response is a bit different since you only receive haptic feedback - but it works. Every single time. Though, speak of, the haptics in the U12+ are pretty stellar. Its so close to offering such a great overall experience. And yet a few very small, yet very important things, keep it from being anything close to something anyone should recommend. At least in this market filled with devices like the S9 and OP6. Too many negative experiences, even J William who is a HTC fanboy is not having the best experience. Complaining about overheating etc. For now, I cancelled my pre order since $900 is a lot of money. I'll revisit later if they fix some of these issues with software updates. Also, I do agree sense needs a fresh coat, I felt it as stale on the U11 itself. I mean if HTC doesn't have money to spend on software team then why bother with sense? Just use Android one or stock and just have your apps like camera and others to enhance the experience. MSFTisMIA and Larry 609 like this. Not sure if his phone is pre unit for review, not final. I'm going keep my order to test drive my own. It's final software. It's been mentioned in various reviews. The U12+ is continuing to get hammered in its reviews (final verdict). From the Verge and it sounds like there's no saving the U12+'s reputation at this point. I'm wondering if HTC should just scrap it all together. One thing that I despise HTC for (which the Verge touched on), is how they switched to that garbage News Republic and TouchPal keyboard. I know they can be disabled, but they had NO BUSINESS being there in the first place. HTC doesn't seem capable of putting together a cohesive complete package without several comprises at this point. Scrap it altogether because of a couple bad reviews? Come on. There is not one phone that has gotten 100% positive reviews, and not all the U12+ reviews are bad. Look, HTC knows they're nowhere near where they once were, and that's when companies try to innovate and differentiate themselves from the rest of the pack. Maybe it's the dual front facing stereo speakers of the M7... maybe it's the dual rear cameras of the M8... now, it's the haptic feedback buttons. Some things hit and some things miss, but you can't blame a company for actually trying. That's one of the best things about Android unlike Apple... we actually have a choice to buy more than one product! Point taken about HTC trying different things. However I feel they chose to try an unconventional approach on something that has zero room for error. They were certainly aware that the buttons weren't without functional deficiencies, yet chose to release it. My biggest gripe with HTC being different is that they didn't aim for having the best user experience when they did so. It seems they implemented something that was just barely good enough and it takes away from what is otherwise a great product. Post didn't belong here so tried to delete. Sorry, nothing to see here. Ooooohhhhhhh darn it, I saw a fresh post and clicked and it was this!!! Seriously, why? No it's not final software. First there's an update that should drop soon. Second most manufacturers continue to update the software for several months to fix problems after release. If the only complaints these reviews have are the buttons than it is absolutely laughable how much this is being blown out of proportion. Who honestly even uses that power button more than once a week? Android has had the "Swipe screen up" to turn on the display for years, that button has become practically irrelevant. The same goes for volume, how many times a week do you need to turn up or down the volume without first turning on the display? Android has it so you can just put it face down to mute the volume. All these negative reviews are completely non factors, i wouldn't have been opposed to them removing those buttons all together, as long as the screen swipes work honestly who cares? It has some of the fastest hardware and the best camera on the market, plus amazon alexa. holz75 and NavyGreen like this. HTC 10 speakers playing stereo sounds horrible - anyone know a workaround?